At last, my autobiography For Facts Sake is ready to roll. 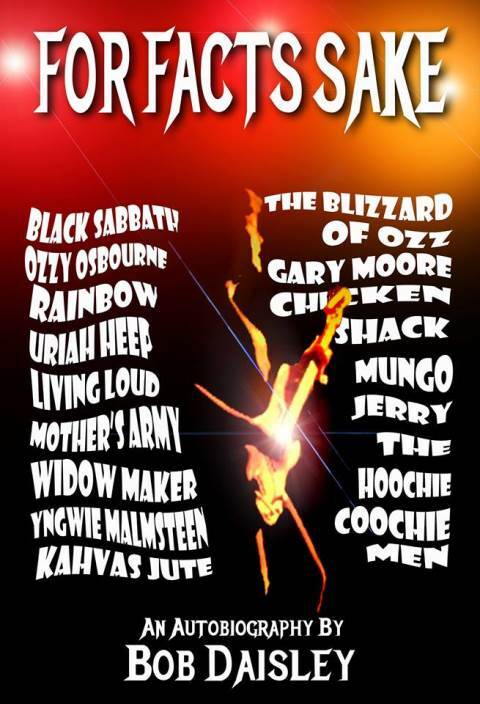 It covers my whole life and my fifty-year career in music, and features everyone that I’ve ever worked with-Chicken Shack, Mungo Jerry, Widowmaker, Rainbow, The Blizzard of Ozz, Uriah Heep, Ozzy (and Sharon) Osbourne, Gary Moore, Black Sabbath, the notorious Don Arden, and too many others to mention here. The stories reveal some interesting and, until now, unknown facts about many of these artists and characters, and with more than 460 photos throughout the text, it provides a pictorial view of my journey. I wanted to make it affordable for the many fans that have given their support, I hope that it lives up to your expectations. Thanks to you all. Signed copies can also be orders for no extra charge. The book costs £18.99p ($29.12) + postage & packing. If you wish to purchase more than one copy, please contact webmaster@bobdaisley.com. The book measures 11″ x 7.5″ (280 x 190 mm) and is an inch thick, there are over 460 photographs, mostly color, the majority of which were taken by Daisley and have remained in his personal archives until now. This is a limited offer and end on the July 28th. Orders received after that date will not be eligible for a signed copy. For Facts Sake will be released August. Please visit bobdaisley.com for more information and to purchase a copy of the book. Yes, you can get together everyone Sharon alienated throughout the years and have a panel discussion. At least you would then get the gravy since you already get the grief. Get the book, every page is worth the postage. Eddie, It would be fantastic if you could get Bob on TMS. When is the book going to be released in the USA.